If you’re anything like me, some mornings are really hard to get out of bed to make something healthy for breakfast. They say breakfast is the most important meal of the day, but why do we so often heat up a frozen waffle or grab a bagel heading out the door? These omelet muffins are the perfect solution for busy mornings on the go. The simple recipe allows you to make six muffins that you can stick in the freezer and reheat all week long. The best part is, there is no set recipe- you can add whatever you like! 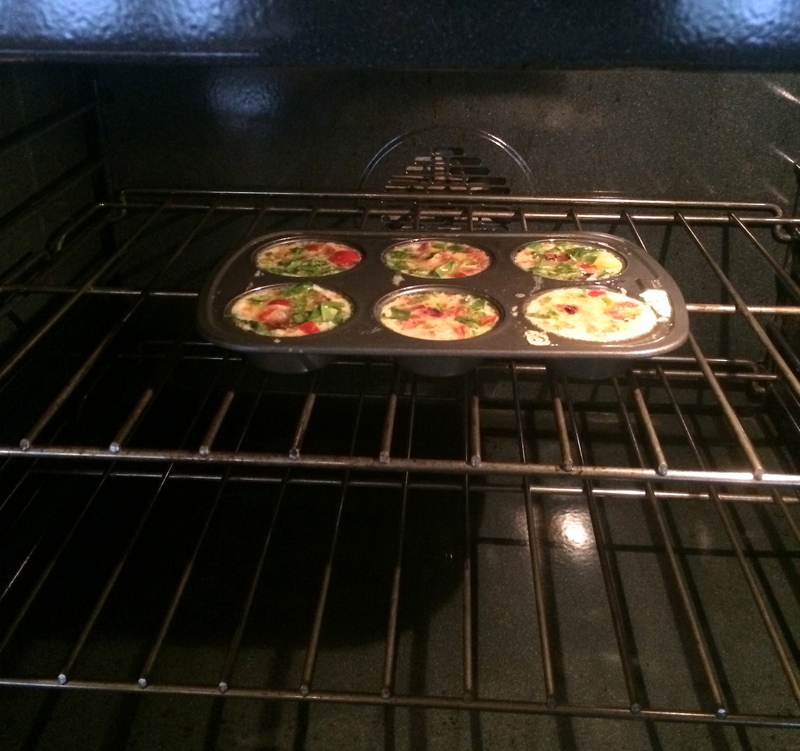 I’ll share what I included in my omelet muffins, but any fill ins you like could work! I started by preheating the oven to 350 degrees, and while the oven warmed up I started frying up three strips of turkey bacon to include in my omelet. While the bacon cooked, I started with the ingredients I wanted in my omelet. I used about ¼ cup of each: diced green and red pepper, chopped baby spinach, diced tomato, and Mexican blend cheddar cheese. Combine two eggs and 1 cup of liquid egg whites and whisk together. By this time, your bacon should be done frying and you can cut the strips into squares to add into the egg mixture. Add salt, pepper, and all your veggies! Spray the muffin tin with a lot of non-stick cooking spray. The more you use, the easier they’ll pop out! You want to leave a little more room in each muffin tin than I did; they expand like traditional muffins. Leave in the oven for about 18-20 minutes, and viola! 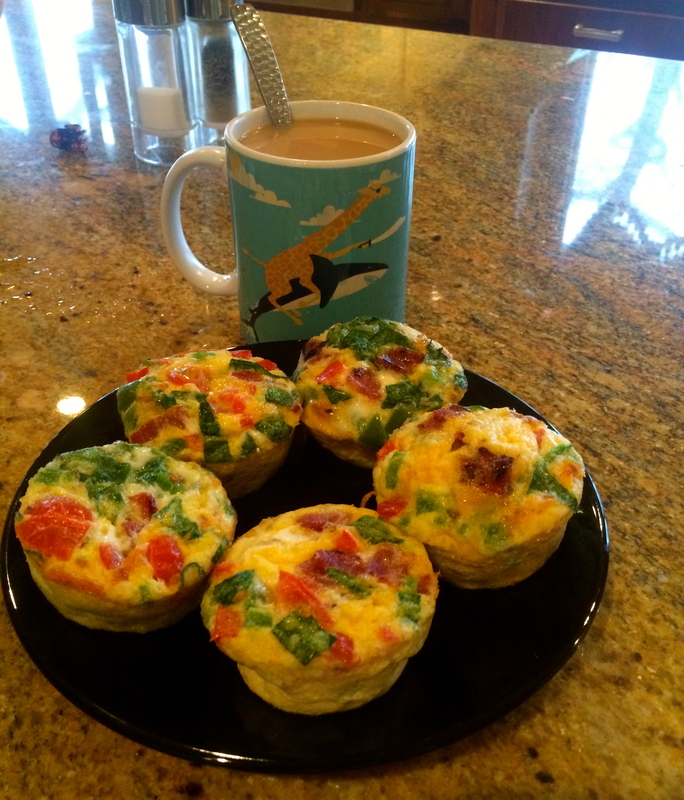 Easy omelet muffins that you can grab and go on all your busy mornings! 1. Preheat oven to 350 degrees. Generously grease muffin tin. 2. Cook three strips of turkey bacon over medium heat on frying pan, about 5-7 minutes each side. Slice into small, bite size pieces. 3. Whisk together eggs and liquid egg whites until frothy. 4. Add chopped veggies, cheese, and bacon to egg mixture and combine. 5. Pour into greased muffin tin, leaving room for the eggs to expand. 6. Bake about 18-20 minutes, until knife comes out clean when inserted into the middle of a muffin. Enjoy your new grab and go breakfast all week long! These look delicious! Bacon makes everything better! Thank you, your page looks amazing!